When the earth started to shake and the rocks fell Billy Bray knew that his life was in danger. When you're down a mine shaft, digging for tin, in the dark, damp tunnels... a rock fall could kill you. Mining in the 1800s was dangerous, it still is today - it was a hard life for little pay and safety measures were few and far between. Surviving that rock fall started Billy Bray on a different path - for the first time in a long time he walked home sober. Drink no longer had the same appeal. The jovial, happy-go-lucky guy who made fun of everything - even God - suddenly realised that he had a soul, that he was a sinner, and that he was in danger of spending eternity in the deepest pit there was - hell. However God's plan for Billy was not to leave him in his sin and misery. Billy Bray discovers true happiness in Jesus Christ and his legacy to the Cornish people included lively preaching, newly built chapels and true revivals. Billy was saved from the deepest pit - and went on to tell others that they can also be saved from their sin. Billy Bray by Michael Bentley was published by Christian Focus Publications in March 2012 and is our 28879th best seller. The ISBN for Billy Bray is 9781845507886. Billy Bray was a tin miner in Cornwall whose main pleasure in life was getting drunk. However he was saved by the Lord Jesus Christ and went on to devote his life to sharing the gospel and establishing churches. 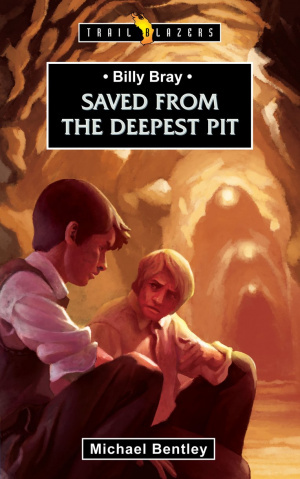 The story of his dramatic preservation during an underground rock fall and his subsequent devotion to his new Lord and Master are recounted in this short biography aimed at children and young teens. The story is recounted in a matter-of-fact way, which can make it a little dull to read. For this reason it might be better used as a read-aloud book for younger children. At the end there are questions for reflection and discussion. The book would make a good Sunday School prize for a boy who enjoys reading about great Christians of the past. Got a question? No problem! Just click here to ask us about Billy Bray.